UFC 198 came to a dramatic end on Saturday night, as Stipe Miocic silenced 45,207 fans in Brazil with a stunning first-round knockout to finish Fabricio Werdum and win the UFC heavyweight title. Miocic entered the fight as a slight underdog, but performed like there was no pressure on him at all while staying calm and relaxed in his first UFC title fight. Miocic showed patience and great footwork before uncorking a hellish right hand to put Werdum down and out in the first round to win the heavyweight championship and bring a title back to Cleveland for the first time in more than 50 years. Much like the odds, Miocic was only picked by 35 percent of fantasy players compared to 65 percent going for the incumbent champion in Werdum. The good news for those players who thought Miocic would get the job done is that 77 percent picked him to win by knockout and he certainly got the job done there. In the co-main event, Ronaldo "Jacare" Souza was a massive favorite, with 72 percent of players giving him the nod to defeat Vitor Belfort. Souza was overwhelmingly selected to win by submission, with 60 percent of players feeling he would tap out Belfort, but instead he finished the fight with a first-round TKO. Either way, Souza came through with the win as expected. The heaviest favorite on the entire card was debuting fighter Cris "Cyborg" Justino, and she proved fantasy players right on the money with 92 percent picking her to win and 88 percent believing she'd get the job done by knockout. It took "Cyborg" just 81 seconds to dispatch Leslie Smith to get her first win inside the Octagon after years and years of waiting to make her first UFC appearance. Another upset that took down a great many fantasy players on Saturday night was Mauricio "Shogun" Rua getting the win over Corey Anderson in a featured light heavyweight showdown. Rua was selected by just 42 percent of players with 54 percent believing he'd get the win by knockout. In the end, Rua actually earned a split decision victory as he defeated the former Ultimate Fighter winner after three hard fought rounds. 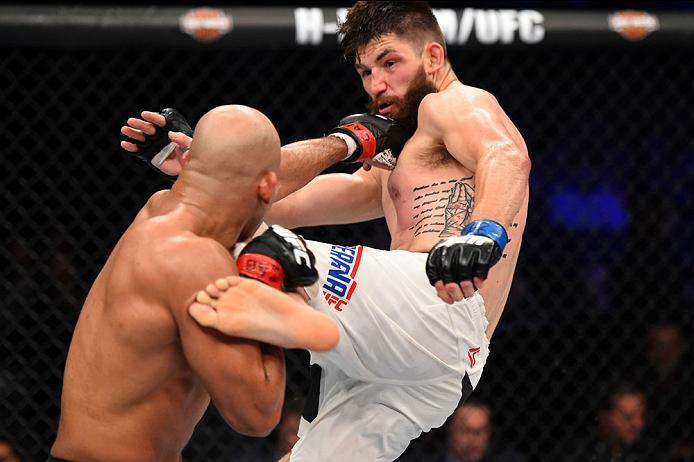 But the biggest underdog to overturn the apple cart was Bryan Barberena, who stepped into enemy territory for his fight against top rated prospect Warlley Alves and walked out with a unanimous decision win. Barberena endured a tough first round from Alves, but then used a superior gas tank to out work the Brazilian over 15 minutes. Barberena was selected by just 20 percent of fantasy players, with 80 percent of those believing he'd get the win by decision. Barberena not only handled Alves his first loss, but he made a definite impact in the final results of the fantasy game for the players who picked him to win. In preliminary action, Demian Maia came through in a big way with 71 percent of players picking him to defeat Matt Brown, with 66 percent getting the call right when it came to his third-round submission by rear naked choke. Thiago Santos was another heavy favorite, with 74 percent of players selecting him over Nate Marquardt. 72 percent of players also picked him to win by knockout and Santos was on the money once again as he picked up his third first-round KO in his last four fights. Finally, in the featured prelim on UFC FIGHT PASS, Antonio Rogerio Nogueira pulled off a big upset of his own as he defeated Patrick Cummins by first-round TKO. Nogueira was selected by only 28 percent of players, but he proved that he still has plenty of fight left in him, as he put Cummins away in front of his home country fans. All told, five underdogs, according to UFC fantasy players, came away victorious, showcasing once again the unpredictability of MMA after another huge night in Brazil.